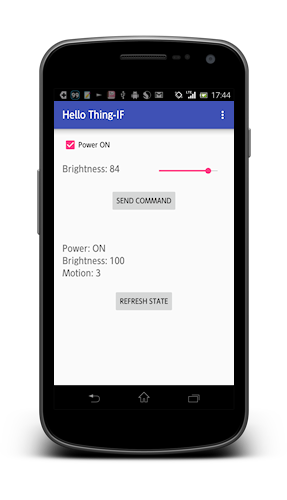 Hello Thing-IF is a pair of sample programs designed to demonstrate how to use Thing Interaction Framework to Kii novices. 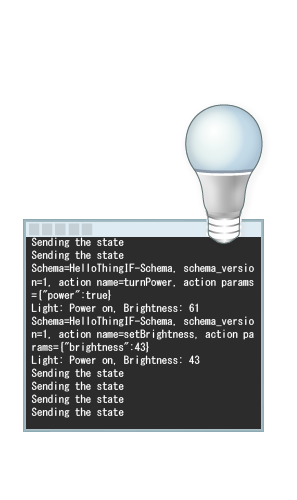 This sample shows how to operate a thing remotely and get its sensor value via Thing Interaction Framework with an example of controlling a simulated smart LED light from a mobile app. Thing Interaction Framework is a feature of Kii Cloud to accelerate IoT solutions and it allows easy cooperation of mobile apps and things in the IoT field. Kii provides the Thing-IF SDKs for mobile apps and things. In this tutorial, you walk through a process of developing a mobile app for Android and a thing program on Linux. The thing will output information required to control it to the Linux console instead of operating hardware components of the LED light. In addition to that, the thing will display an auto-generated number as the sensor value on the mobile app instead of reading an actual sensor value. The Thing-IF SDK for C, which is be used on the thing side, has a high portability. You can incorporate it into various embedded devices other than Linux in the end because you can implement OS-dependent processes such as communication and task generation in the user program. Hello Thing-IF is a pair of sample programs to show how to use Thing Interaction Framework and how to design your programs. It is designed to get you started in understanding how to implement an IoT solution with Kii Cloud. At the same time, it generally covers basic Thing-IF implementations so that you can use its source code as a skeleton applicable to actual development projects. This tutorial explains how to use the APIs and the basic concepts necessary to understand to design your programs. The last topic of the tutorial introduces tips for information gathering and features necessary in actual application development projects. This tutorial assumes the audience are familiar with how to implement mobile apps on each platform and how to work in development environments. Refer to books or websites for more information on such topics. The tutorial topics discuss these four subjects. Kii recommends reading these topics in order. This section gives an overview of Hello Thing-IF and explains how to design an entire system. In addition, it explains the flow of building and running the sample programs. This section explains how to implement the Android app and details of the source code. This section explains how to implement the thing program and details of the source code. This section provides tips to start your actual project. You can also develop an iOS app with Thing Interaction Framework. Sample code and a tutorial for iOS will be provided in the future. For now, if you want to develop an iOS mobile app, use the topics for Android as a reference to learn how to use the Thing-IF SDK. Thing Interaction Framework is explained in detail in the Thing-IF SDK section of the Function Guide and Thing-IF SDK Development Guides. Click the hyperlinks in the Learn More section at the end of each tutorial topic for more information about technologies mentioned in the tutorial. The hyperlinks jump to corresponding topics in the Thing-IF SDK section of the Function Guide and Thing-IF SDK Development Guides. The sample programs in this tutorial have minimum functionalities that you need to understand in the first steps. Apart from this tutorial, Kii provides sample apps with a complete set of functionalities of the Thing-IF SDK for Android and iOS. The Thing-IF SDK for C includes sample programs which can be used in Linux and other environments.